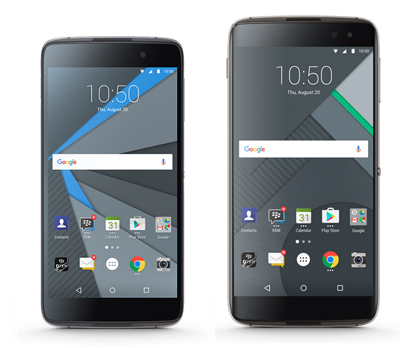 Canadian mobile maker BlackBerry on Monday launched two new Android smartphones—DTEK50 and DTEK60—in India. BlackBerry has launched its third Android-based phone in New Delhi—the device whose success will be a do-or-die for the company's viability—opting to price its top-end device well-below Apple Inc's iPhone 7. The BlackBerry DTEK50 was launched in July 2016, and began shipping in select regions in August. The BlackBerry DTEK60 was launched last month. Blackberry, which has lost most of the market to Apple and others, last month said that it planned to completely outsource the development of its smartphones to focus on its more profitable business of making software and managing mobile devices. It clearly means that the Android-based DTEK50 and DTEK60 will be the last phones for which BlackBerry buys components itself, which carries a heavier risk if it does not sell well. The DTEK50 and the DTEK60 are priced at Rs 21,990 and Rs 46,990 respectively. The DTEK50 will go on sale starting this weekend, while the DTEK60 will go on sale by early December. Blackberry also announced its partnership with Optiemus, a Delhi-based telecom enterprise, to distribute and promote BlackBerry handsets in the market. "India is a very important market for BlackBerry and we are delighted to announce a new partnership with Optiemus Infracom Ltd that strengthens our network of key partners in India and enables us to deliver our secure BlackBerry Android experience to more customers," Alex Thurber, senior vice president, global device sales, BlackBerry, told reporters at the event. Waterloo, Ontario-based BlackBerry does not have any deals with telecom companies to distribute the device. Instead, it has been pitching the phone directly to companies and governments, as well as selling it on its own websites in the US, Canada, and several major European countries. Both the smartphones run Android 6.0.1 Marshmallow with BlackBerry's hardware. The customisation alongside BlackBerry Enterprise services, and the DTEK by BlackBerry app, makes the company call them the 'world's most secure Android smartphones'. Blackberry is also claiming that the smartphones are ready for enterprise adoption with its Enterprise Mobility Management solutions. The DTEK50 features 5.2-inch full-HD display with a pixel density of 424ppi, 3GB of RAM, powered by a 1.2GHz octa-core Qualcomm Snapdragon 617 SoC. It also features a 13MP rear camera with a 6-element lens and an f/2.0 aperture along with an 8MP front camera with LED flash. The device has 2TB of expandable memory and houses 2,610mAh battery. The device is said to come packaged with quick charge 2.0 that will charge the device 50% in 51 minutes. The DTEK60 features a 5.5-inch quad-HD display with a pixel density of 534ppi, the device is powered by a Qualcomm Snapdragon 820 SoC and 4GB RAM. The 4G LTE smartphone features a 21MP rear camera PDAF, dual-tone LED flash, along with a 6-element f/2.0 lens and an 8MP front camera. The device houses 3,000mAh battery and also packs a fingerprint sensor.